The helmet is the only bit that looks right, though Urban's could do with being a size or two smaller. The bike is more '60s Batcycle than Lawmaster, and that uniform is just crap. 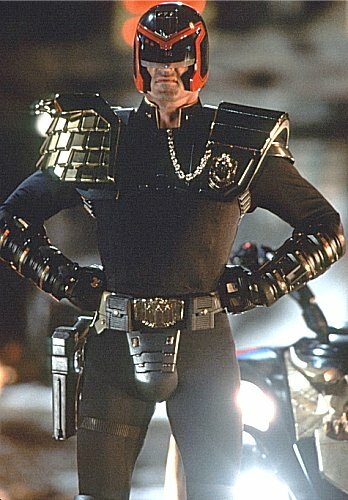 Seriously, at least the Stallone uniforms and bikes LOOKED right. Bad plot, and Rob Schneider was annoying, but at least it LOOKED right. I'm taking back a lot of things I said about that film, and needless to say all my hopes for the new movie are circling the drain at this point. In this city, Justice comes at a price- that price is FREEDOM! Re: Are we all looking at the same photos here or what? Seriously, at least the Stallone uniforms and bikes LOOKED right. Yes, really. Look, it's got the trademark giant shoulderpads! Which he threw off at the earliest opportunity. Yes, I agree. After seeing 2 photographs I'm ready to completely write off the entire film BECAUSE THAT WOULD BE A REASONABLE THING TO DO. In case you can't tell, I'm being sarcastic. Everybody is entitled to an opinion I suppose, but when you're basing your opinion on what amounts to a couple of poor quality photos, it's impossible to take you seriously. Gosh, not everybody has the same opinions. Well, whaddaya know. Who'da thunk it? If I'd realised that before I'd have started a thread about it too. Heh- I'd figured (or hoped!) as much! Don't you hate the kind of person who posts on a thread just to give out about the topic? Is that because you're shallow, fickle and can't stand by any unreasonable thing you've said before? In that case we'll wait for your volte face when you start liking the new one before we pummel you a new dirt-pipe. I'll agree with you on the bike, but Stallonedredd?.....Ehh. Could you not have just posted this in one of the existing movie threads? Is you opinion so earth-shattering and mind-blowing that it deserves a thread all of its own? Can someone merge this thread with the main one please.